Harald Siepermann had a passion for drawing since a young age. 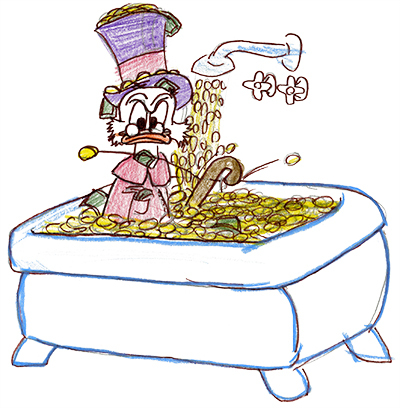 Here is an illustration of Scrooge Duck by Harald around the age of 10. Various sketches by Harald Siepermann from the early 1980’s. While Harald was still a student at the Folkwang University he met Dutch singer and entertainer Herman van Veen. “I visited a concert of Herman van Veen in Recklinghausen, Germany, and then recognized the same energy that I felt, the same way to look at things,” said Harald Siepermann. “A train of thought that felt very familiar to me. I knew that he had his own publishing house Harlekijn, and during the concert I played with the idea of ​​addressing him and possibly asking for advice. So I just went to the cloakroom and addressed him.” Van Veen was impressed with Siepermann artistic talents and it resulted in a lifelong collaboration. Their most famous creation was the duck Alfred J. Kwak. 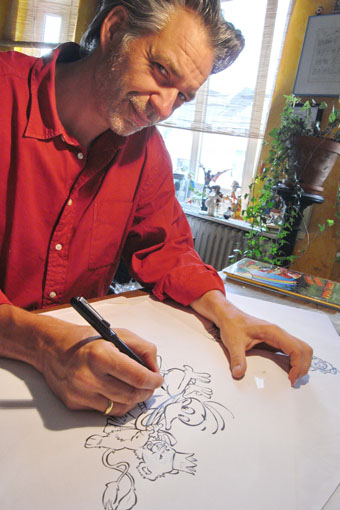 Harald Siepermann working on an illustration of Alfred J. Kwak. Meanwhile the character Alfred J. Kwak reached new heights. After Siepermann and Bacher created the first comic book about the duck, television producer Dennis Livson wanted to create a television series about the adventures of the duck. Herman van Veen wrote the synopsis of 52 episodes and Harald Siepermann and Hans Bacher did the production design of the series. An ambitious task since the television series contained 250 unique characters. The series was broadcast worldwide and became an immense success and a merchandise phenomenon, with exclusive illustrations by Harald Siepermann and Hans Bacher. After the success of Alfred J. Kwak, Siepermann worked on various projects, among them the movie Balto from Steven Spielberg’s Amblimation studio in London. He stayed for several months in London to work as storyboard artist on various sequences for the movie. Another major opportunity arise in 1995 when Siepermann was asked to work on the character design of the little dragon Mushu for the Walt Disney classic Mulan. This was the start of a collaboration with Walt Disney on several production such as Tarzan, The Emperor’s New Groove, Treasure Planet, Brother Bear and Enchanted. Besides his work for Walt Disney he also did character designs for other productions like Gnomeo & Juliet, Lissy und der wilde Kaiser, Space Chimps, and The Gruffallo. In addition to character designs for big studios Harald Siepermann also gave lectures about character design and storytelling for animation at several renowned art schools in Germany, Denmark and Singapore. His last project was the German computer animation movie Der 7bte Zwerg, which he directed and created the character and storyboard designs. Harald Siepermann died during the production of the movie on February 16, 2013, at the age of 50. Character designs by Harald Siepermann for the German computer animation movie Der 7bte Zwerg.